Adding lighting to an exterior sign structure is typically a major undertaking. 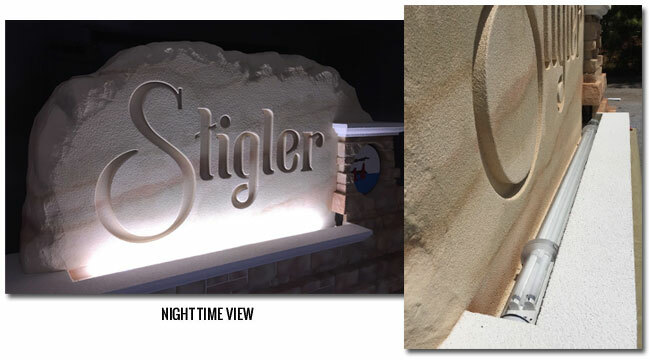 A local sign franchise will design a solution that requires outsourcing the fabrication of any lighted elements which would then be integrated with another outsourced vendor for the monument structure. Then an electrician will further complicate things integrating components, which is a different electrician that makes the final connection to the electrical panel (who will try to up-sell a timer device). 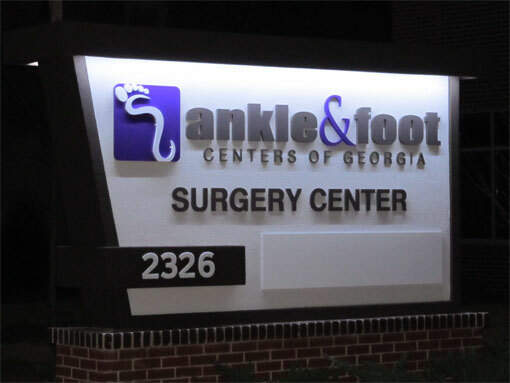 We have simplified the entire process by offering complete integrated lighting in our modular sign monument solutions. For both new sign projects and retrofitting existing signage. In short, you tell us what type of lighting you want (ground lighting, back-lit graphics, integrated monument lighting) and we will suggest lighting options, then deliver a fully-integrated solution (new monument) or a complete system ready to install (existing monument). Our solutions only require a dedicated ('live') electrical feed. We can integrate a daylight sensor to turn your lighting effects on & off with the sunrise/sunset. We utilize LED lighting technology which is not only a third the utility costs, but is also twice as bright as traditional lighting, and had a (20) year expected lifespan. In short time, our energy-efficient lighting solutions will pay for themselves in savings on your monthly utility expenses. Contact one of our Lighting Specialists for more information. Provide us with specific details so we can best suit your lighting needs. We will gladly offer options that are not only cost effective, but will also save you money on your monthly utility bill. Take comfort in knowing you are in direct contact with the Best in the Industry.